As you all are hyper aware of at this moment of time it is nearly my favorite holiday of the year and few people know this but I am sure you well educated Darklings are is that Halloween was not always known as Halloween but rather as Samhain (it has various pronunciations so don't get your stripy stockings in a twist if someone says it different to the way you do) Also known as the pagan holiday for the dead and dearly departed souls as it is the time of year where the veil between the many worlds is at it's thinnest and makes it a lot easier for our ancestors to come visit and give us that often unwanted advice however it is also a time to celebrate your lost loved ones lives in the full, it is a time for celebration, fun and most importantly Pumpkins. Yes Pumpkins. 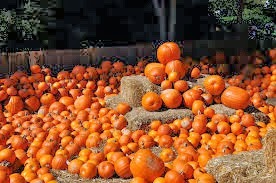 Those roundish orange squash like fruits/vegetables (does anyone actually know what they are classed as as I,m not sure and too lazy to look up at this moment in time) that appear in Jack,O,Lanterns and pies and all sorts of various goodies for us little Darklings to enjoy and marvel at. so thats all for now my wonderfull Darklings have a lovely day/morning/evening/etc and blessed be!